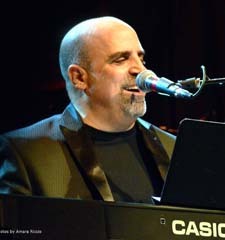 Based in Chicago - Currently, Nick Psyhogios has been performing as Chicago's Own Piano Man with a large repertoire of music ranging from Billy Joel, Stevie Wonder, Elton John, Otis Redding, Jerry Lee Lewis and more! He performs with his own quartet or as a soloist, playing piano and singing. Nick is a lifelong musician, songwriter & producer. He is self-taught on several instruments including piano and guitar. In the late 1970's and 1980's Nick was in a band called "Stagger" which evolved into "Ruffian". Ruffian performed at several Chicagofests and traveled the country. Ruffian also opened for a diverse group of acts including The Ramones, Brian Adams, Greg Kihn, Tower of Power, Dion and Survivor. That band attracted the attention of Paul Anka who signed them in 1984 when they recorded an album in LA where he worked side-by-side with David Foster, Paul Anka, and Patrick Simmons of the Doobie Brothers. Through the 1990's Nick performed for Anheuser-Busch in an a-cappella ensemble that he orchestrated called "The Rockets." They performed at numerous conventions such as the National Restaurant Association, Food Market Institute, and other venues representing Anheuser-Busch for over six years. Nick coordinated the entire production for that group, and wrote parodies, which they performed across the country. Nick also wrote & produced jingles for local radio sport shows, and specifically one for a software product called The Study Game by Lessonware.